"I had this cranberry martini recipe at a holiday party and everyone loved it. The cranberry juice mixes nicely with the liquor. It's a perfect smooth drink." Combine vodka, orange liqueur, vermouth, cranberry juice, and ice in a cocktail shaker. Shake vigorously to chill. Pour into martini glasses, and serve. Garnish with cranberries. Beware! This cocktail is smooth and potent. I think this drink maybe better than a Cosmo. I decreased the vodka and increased the cranberry juice. It was DIVINE! 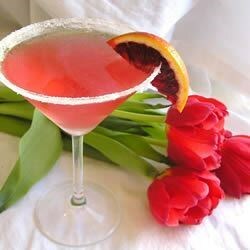 Very similar to a Cosmo. We enjoyed it. I added 3 ounces of juice and added a bit more alcohol than stated just to make up for the extra juice. It was tasty, refreshing, but potent. Great! I used cranberry vodka and cranberry/pomegranate juice for even better results. Garnished with cranberries and a twist of lime for a red and green holiday look. Very nice-thanks! So yummy - I doubled the amount of cranberry juice so they wouldn't be too strong and got rave reviews from my guests. This will certainly be added to my drink catalog!